The Arctic Grayling, Thymallus arcticus, is beautiful sport fish that is easily recognizable due to its large sail-like dorsal fin. The silvery to light purple colors on the sides and bluish-white on the belly are the distinctive colors	of Arctic Grayling. They are relatively slender and are most easily distinguished by their long, high, brilliantly colored, bright purple, sail-like dorsal fin. The arctic grayling is holarctic in distribution, which means that the species occurs in the northern parts of North America, Europe, and Asia. The arctic grayling is not native to Utah, but it has been introduced into several high elevation lakes in the Uinta Mountains. The arctic grayling eats primarily invertebrates, including insects, insect larvae, and zooplankton. The species spawns in streams during the early spring, and eggs hatch in two to three weeks. Arctic grayling prefer clear cold water and the species does best in streams and lakes containing at least some aquatic vegetation. Grayling can live and reproduce in lakes that are marginal for trout because of low dissolved oxygen levels in winter. Fisheries managers use grayling to provide additional fishing opportunity and diversity in Utah's High Uintas. Grayling are not commonly found in most areas of Utah. In fact, to catch a Grayling in Utah, you'll have to do a little hiking in the High Uinta mountains. Most anglers who find a lake that does have Grayling in it will keep it as their own 'secret spot' and guard it with their very lives. This is due to the scarcity of places to fish for Grayling in Utah. 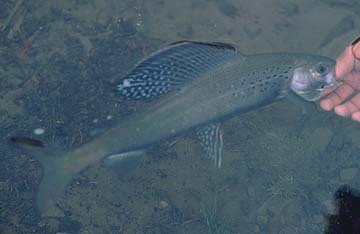 Grayling are related to trout and can be caught using familiar techniques. Small lures and small, dark flies are usually effective. The fish can live and reproduce in high, cold lakes that are marginal for trout because of low winter oxygen levels. Fisheries managers use grayling to provide additional fishing opportunity and diversity in Utah�s High Uintas. The Windriver Mountains in Wyoming also are home to many high elevation lakes that contain good populations of Arctic Grayling, some as large as 14 inches long. Recent stockings in the last couple of years have placed Grayling in dozens of other waters across Utah. See the Utah Fish Stocking Report for more details.